The chicken/bunny cage needed some housecleaning so I let my girls play in the yard while I cleaned their mansion. 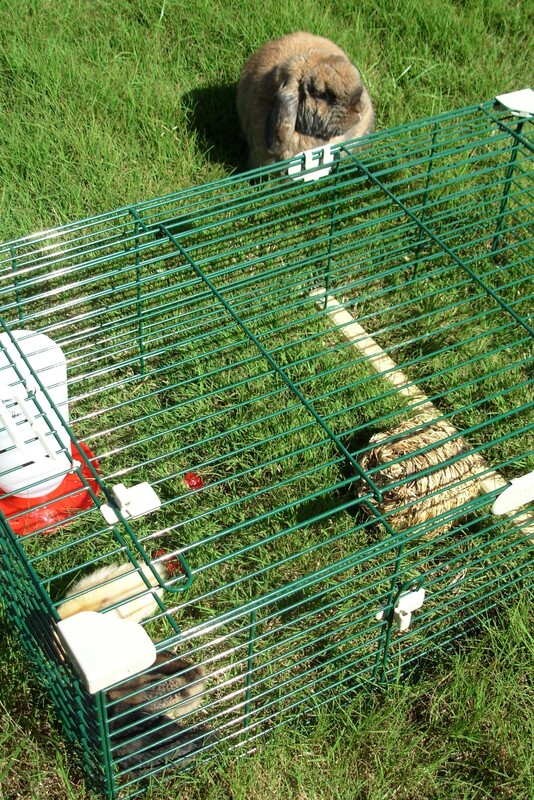 They scratched around in the grass under just the “cage” part of their house while I scrubbed the bottom and let it dry in the sun. The weather was spectacular. 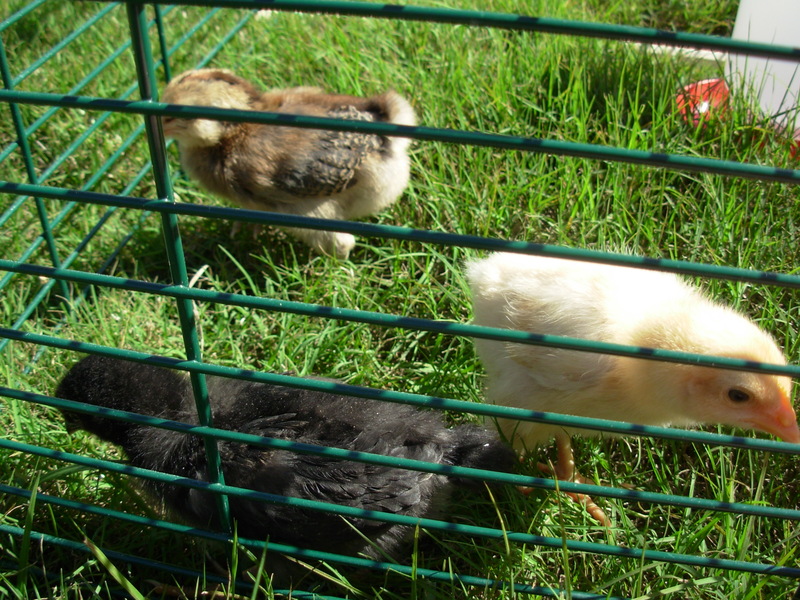 The sun was shining and a slight breeze ruffled their feathers while they preened, stretched and scratched in the grass for tasty morsels. An occasional flying insect would meet its doom by flying into their outdoor playpen. I let my Holland Lop Bunny, Buster out into the yard and he stood sentry by the pen for 30 minutes enjoying the sunshine and entertainment. The morning routine is developing into a fun ritual. First thing, I check on the ladies and clean and refill their water. Then I sit in front of the cage and open the door. Violet is the first one out and Rosie and (eventually) Daisy fly the coop. Violet flies to my knee and makes her way to my shoulder to peck on my pearl earring. Today all three chicks “discovered” my diamond ring. It’s a massive symbol of my husband’s love for me. All three girls took turns pecking at the bauble. These chicks have real style. They love diamonds and pearls. The girls are growing and developing according to plan. They are two weeks old today and have some new “features”. Daisy is growing a little “comb” on her head. Rosie is losing her baby down and getting fatter. 90% sure. They were “sexed” by a “chicken sexer”. Yes, that is an actual job! 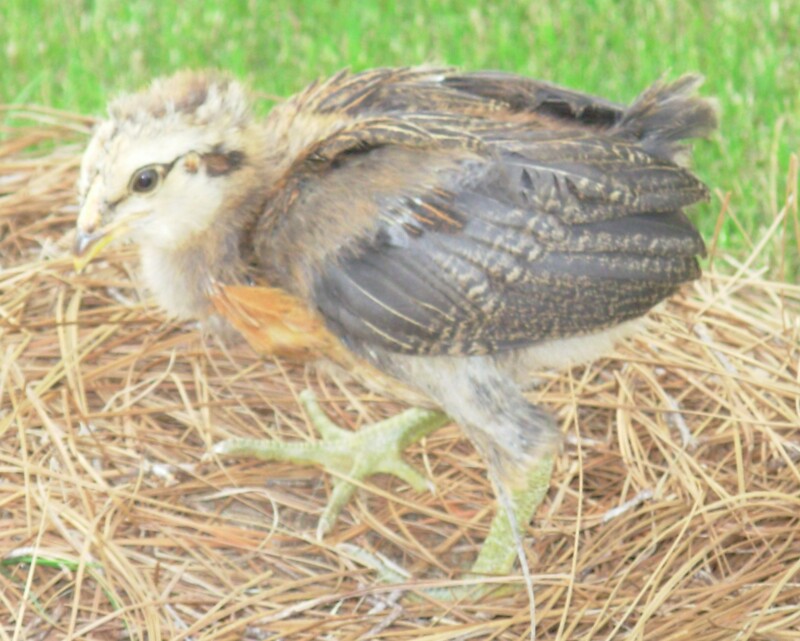 If I do have a surprise rooster, I have already found a nice home for him. Let’s hope they are all lady birds. Wow! I did not know this was your friend. I go to this site often for advice. Thank you. I miss you, my cousin. Just wait until the ‘gifts’ start getting bigger! Can’t wait to come visit & have some fresh eggs! The girls are working on a special omelette just for Aunt Beth!